BentoLunch.net - What's for lunch at our house: Guest Post & Angry Birds! Guest Post & Angry Birds! HI! I'm Michelle from Creative Food and I am honored to be here! Shannon's blog is such an inspiration to me and to so many others. Her bento lunches are so simple, easy to recreate and adorable. What's For Lunch link up every Wednesday is so awesome to go through and check out for more lunch inspiration! So thank you to Shannon for letting me guest post here! To make this simple bento lunch I made her a wowbutter (peanut free and nut free spread) and honey half sandwich. I used my Angry Birds Cookie Cutter Stamps on a piece of bread and placed them on top of the half sandwich. You can use a little dab of honey to "glue" them on. In the silicone cups she had cucumber "pig noses" (made with a large straw) and some sliced strawberries. I put an Angry Bird cupcake ring in for decoration-- and that was it! 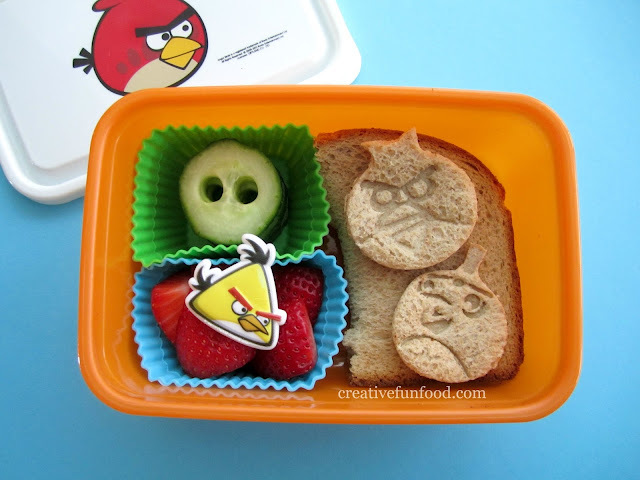 I made this Angry Birds Bento for her in less than 5 minutes! Having pre-washed fruits and vegetables in the fridge made this lunch come together very quickly. And Eliana LOVED it. I hope you enjoyed it too! For more details on this bento and for the full post please see HERE.